Aimed strictly at the younger drivers; the children's Karting parties are a chance for kids from 4-11 yrs to experience the thrill of motorsport with their own, extremely safe, exclusive racing event. 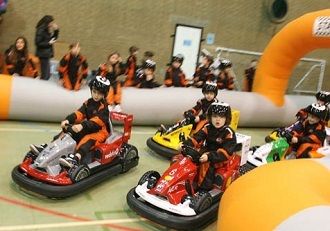 Upon arrival drivers will receive race suits, helmets, a full safety briefing then the kids are divided into teams with each team sharing one of the amazing F1 karts. The teams are given their own flag to encourage their friends on track and for safety the kart speeds can be limited based on the age and experience of the drivers, from 4-10 mph. Buckhurst Lane is just off the main A225 that runs through Sevenoaks and within 5 minutes walk from the mainline station.